Conjuncivitis is an unpleasant thing. So I've been told. I've never had it. But there's not really much one can do about conjunctivitis except wait it out. Eye drops, sure. Lauren picked up some antibiotic eye drops in Ronda yesterday at the first sign of irritation. Right now, though, we're in an abandoned slaughterhouse on the side of the road outside a small farming community. We can't do anything but pedal on. We're headed to the Vía Verde. Not so much the Vía Verde as a Vía Verde, for there are a great many. Over a hundred Vías Verdes (literally "Green Ways") cutting across Spain for thousands of kilometers. Mostly, they're old discontinued railways converted into recreation trails for hikers and cyclists. Rail trails, as we would call them, are a wonderful thing. For one, they're built to accommodate trains. Trains cannot handle sharp gradients. And so the railway must be carefully engineered to cut through mountain ranges like the Sierra without climbing more than two or three percent at a time. This makes for very pleasant cycling with very gradual ascents. Rail trails are also wonderful because they're quiet. No one likes the sound of train horns outside their home, and so railways (at least once they leave the station) tend to chart a course through tranquil, empty countryside. Few roads, few people, plenty of wide open spaces. No risk of being run over by a distracted driver. The Vías Verde of Spain are mostly disconnected from one another, so it's not like we can take rail trails all the way across the country, lovely as that may sound. 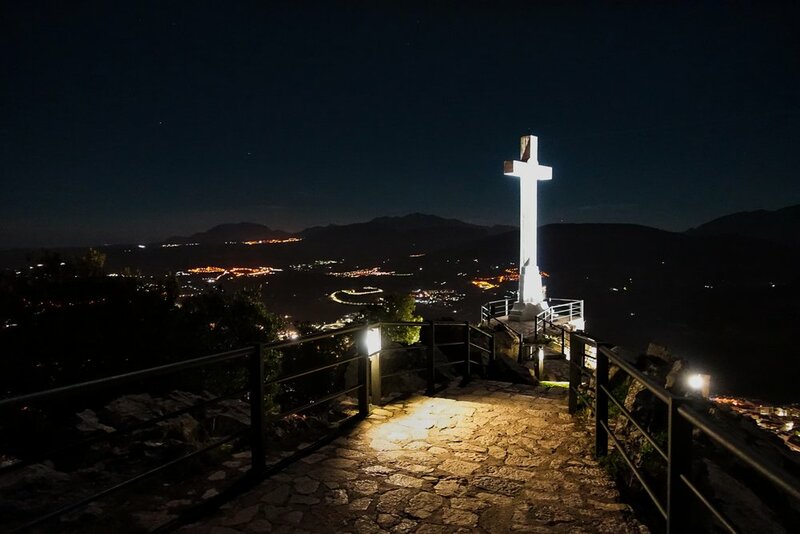 But the one we're headed toward, the Vía Verde del Aceite, features over 125 kilometers of uninterrupted bike path leading all the way to Jaén. We reach the trailhead by evening, camp in a muddy olive grove a few kilometers in, and begin pedaling the greenway the next morning. It is quite pleasant. 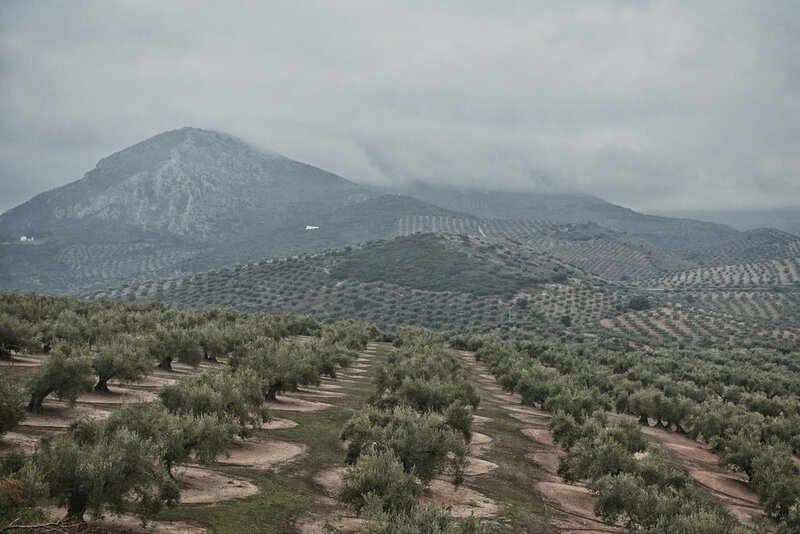 Aptly named, the Vía Verde del Aceite—the Olive Oil Greenway—wanders through the heart of Spain's olive country. It's an unimaginable expanse of olive trees blanketing the earth in every direction, planted in long neat rows and all seemingly identical. They climb the hills and spill into the valleys and disappear into the grey mist of the Sierra Nevada in the distance. They are everywhere and they are unending and they fill the air with the rich, thick aroma of fresh olives. We are surrounded, literally, by millions of olives trees and, figuratively, billions of olives. We learn later that Spain is the world's largest producer of olive oil. Coming from America, we grow up thinking that olive oil is a very Italian thing. And it is. But it is because Italians buy their olives (and sometimes their olive oil) from here in Spain. Andalucia. They buy it and they bottle it and they sell it in fancy bottles saying Made in Italy, but more often than not it's just packaged in Italy. The real stuff, it comes from right here. 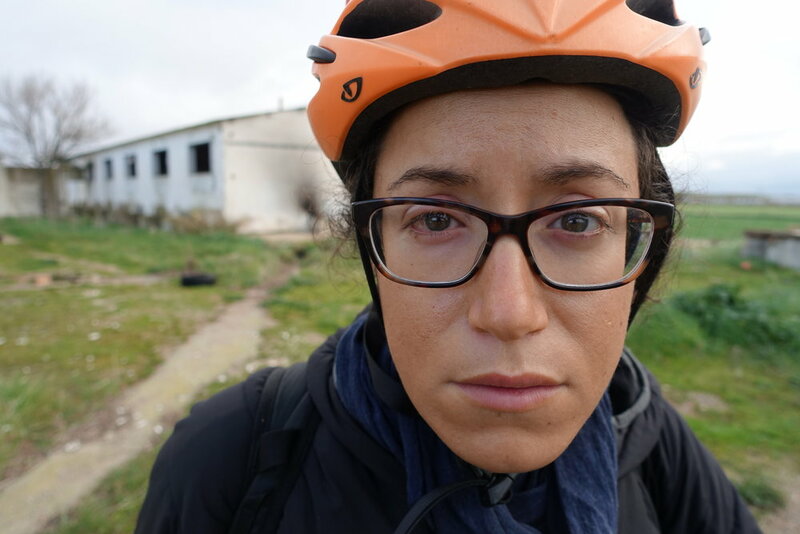 We ride through unbroken olive groves for two or three long days. At night we camp in the fields, always cold and wet. It's near freezing here in olive country. Under grey skies, our health falters. I got sick all the way back in Fes, and I'm still sick. Sore throat, congestion, a deep cough. Lauren got whatever I have back in Algeciras and is now suffering from the same symptoms. Plus, she has pinkeye. We wake up in the morning and I have it too. I don't even have to open my eyes. I just know. Or maybe I know because I can't open my eyes. My left one, anyway. It's sealed shut in a thick layer of crusty mucus. It is painful and it is supremely disgusting. As we cross the olive country, matters worsen. We awaken one morning and Lauren's pinkeye has spread to her left eye. By mid-afternoon, my pinkeye has spread to my right. Eyelids swollen, corneas swimming in a mélange of tears and stringy goop. Like snot of the eyeball. The left side of my face is particularly inflamed. I look like Quasimodo. I take to wearing sunglasses, because I'm hideous, but the sunglasses don't allow me to fit in much better with the fellow humans using the trail. Because it is, after all, a very cloudy day at the end of December. Not appropriate weather for sunglasses. It is, indeed, the very end of December. New Year's Eve. We assumed we'd be spending this night like our past several nights, camping in misery, but this morning we received an invitation through Warmshowers (an online cyclist/couchsurfing community that we haven't really been able to participate in since Cape Town) to come join Eladio and his family in Jaén. Last summer Eladio took a long trip around Spain on his bicycle, and stayed with folks along the way, so now he's eager to return the favor. And we're all too eager to join him. We arrive in Jaén looking like monsters that have just crawled out of the swamp, but Eladio doesn't seem to mind one bit. He's kind and cheerful and we feel an instant connection. Once we've introduced ourselves, he lets us in on a little bad news. You see, he says, the room I was going to give you two is also listed on Airbnb, and just this morning someone booked it. But if you wouldn't mind, my family owns a flat just a few blocks away that is totally empty. You can stay there for as long as you'd like, and come over to our place whenever. You'll be joining us for New Year's Eve dinner, ¿sí? So, Eladio is wonderful, and the apartment is wonderful, and the shower before dinner is wonderful, and dinner is wonderful too. We meet Eladio's beautiful family and enjoy a long, intimate evening over several bottles of wine and several courses of delicious food prepared by him and his mother. We spend our second holiday this week with a family of strangers that feel like old friends. We each eat twelve grapes during the first twelve seconds after midnight, a Spanish tradition to ring in the new year with good luck. It is 2018, and we walk back to our flat in the wee hours of the morning feeling pretty beaten up on the surface but pretty fantastic deep down where it really matters. We'd planned to leave in the morning, or the second of January by the latest. But Eladio insisted we stay until we're better. Look at you guys, his eyes say. You're a mess. We are a mess. My left eye is still swollen shut, and I walk around Jaén as though I'm giving the world the stink eye. Lauren spends half the night coughing up a lung. Our bed is covered in discarded tissues, dry and hard, and our bodies just feel pummeled. Seriously, the flat is there for you, Eladio says. Use it. We relent. We stay a second night, and a third, and a fourth and a fifth. Lauren goes to the doctor and gets some medicine. We sleep a ton. Slowly, our bodies heal. Eladio and his family own olive trees, and they spend the week beating olives off the branches for the harvest. They invite us to join, but only if we feel up for it. It sounds like a whole lot of fun, but we're not yet up for it. I can hardly stand. Eventually we make it outside. We drive with Eladio and his grandmother to the remains of a castle, now a boutique hotel, perched atop a hill overlooking Jaén. We go to a bar one night with Eladio and a few friends. We visit a department store and a shopping mall and it's our first experience with mega-retail since leaving America. I'm overwhelmed by the sheer amount of things to buy. There's a small sports section on the sixth floor of El Corte Ingles, and I swear there are more bike parts in that little corner of one store than the whole of Botswana. Lauren and I buy a few new clothing items to replace the well-worn articles that have carried us through Africa. We buy jeans to blend in a little better with the European chic. We rest. We recover. And we get ready to leave. On January 15th, we have friends meeting us in Barcelona. It is January 5th and we are very, very far from Barcelona. They're coming from DC, and their flights will deliver them here in a matter of hours. We can't wait to see them, but we still have a long way to go to meet them. Cycling through the mountains to Barcelona on any sort of enjoyable timeframe will take weeks. We could have made it if we left Jaén on the first. Or the second. Or the third. But it is now the fifth, and we just don't think we have the time anymore. Not enough to do it and have fun doing it. So we've agreed to get as far as we can as quickly as we can. Maybe Valencia, maybe a little further. And on the morning of the fifteenth, we'll just take a train from wherever we are into the city. That's the plan. Keep moving. So then. It's time to get going.